Production | Crews | Characters | Sourcing | Locations | Building Sets | Shoots | Join in! A prop is anything that isn't a set, location, or character, that's in a shot. Locations may come with their own props (e.g. vehicles rezzed temporarily for a visitor) otherwise it's up to a production crew to make/buy/modd items, either to "dress" the set/location, or to be used by the the members as they play characters. The most common use for props is the dress a set, so that it looks more believable or lived in. If you're using a Builder's Buddy or "BB" (see Sets) to deploy a set, you may have a group of props included in that, which can be rezzed into place. 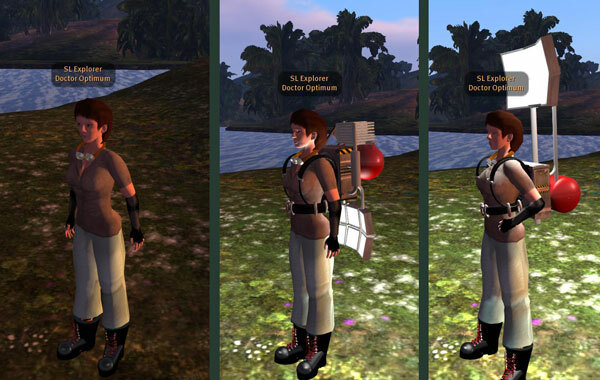 For example, figure 1 below shows the props that get rezzed for G Dock at D'Olby's Base. These are static props that you wouldn't expect to move much between scenes and images in a scene. If they weren't included in a BB they'd be fixtures. However, suppose that part of the set has been damaged in a previous scene, it may be that the objects need to be modified to reflect that. The signs and wall might have blast or scorch marks, and fuel tank might have a large hole in it! The scorch marks can be simulated by adding one or more decals. A decal is very slim prim with a semitransparent texture on the visible side, and is placed flush with an object, so that the image on the decal looks like it's on the object. The fuel tank is a mesh object would probably need to be replaced by a similar mesh object showing the damage. Now it was likely that in later scenes these items might be moved, missing or replaced (in fact they were all upgraded due to a plot development). So there's no point in adding them to a BB for that part of a set. Instead they can be placed or removed as needed. The issue then becomes one of continuity. You should always copies of the images used for future reference. That way if you have to redress the set, it'll match up with the previous version. It's vital that you organise your inventory properly so you can keep track of which prop belongs with which location, set, or part of set. 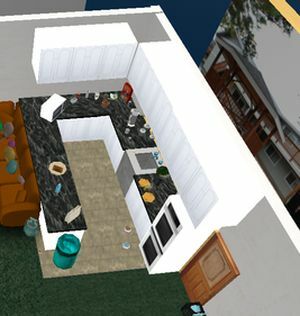 Figure 3 at right shows part of Elsie's inventory, and lists the props in the Jenn's Flat set that appear in the kitchen area of that set. Figure 4 below shows some of these in place on the set. 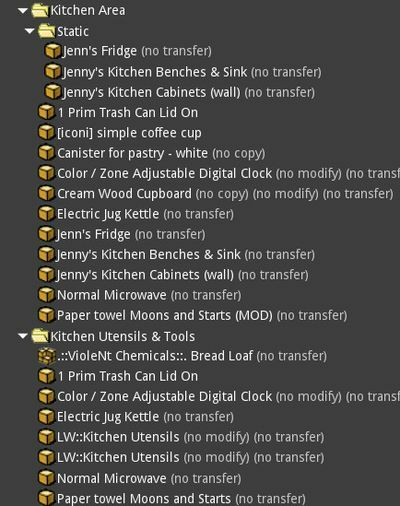 Only the kitchen props in the static folder will always be used or in the same place, the others will vary. 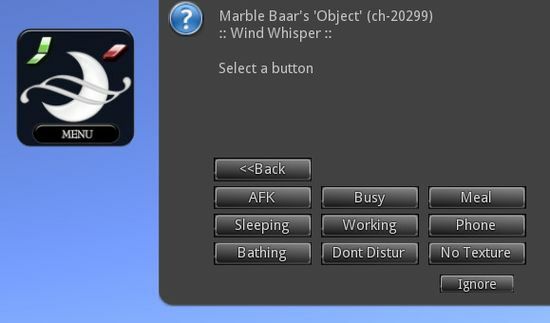 Part of the fun - especially in Second Life which has a thriving arket place, is in modding a prop to do something or be something it wasn't before. The idea candidate for this is an item that's already very cheap ($L zero is perfect) that's copy and mod. Of course you can modd free items in the Hypergrid as well, and usually that might be altering a free item available from either Outworldz or Zadaroo (or elsewhere). In either case it's simply a matter of modifying a copy of the original. Figure 5 below shows the Dr Optimum character. At left Optimum stands unassisted. In the middle she's wearing an unmodified Asslight 9000, part of a personal illumination package which is no longer available. Clearly this is meant to be a joke, but after modifying it we get the arrangement at the right. It's still a bit of a joke, but was used on the what are you doing here? page. Some props are useful because they save you effort later. Instead of just being a prop, they may also contain poses, or be HUDs. For example a rifle that can be posed in several positions, and pose the avatar wearing it, will save having to find specific poses for the same purpose. In figure 6 below, Dr Buggle has bought a Ls_WindWhisper01(Cherry Pink). Wearing the phone attaches it to the right hand, and touching the phone swaps the pose for the avatar weraing it, between down at the side, and at the right side of the head. This is fine, except by default the phone displays a rotating text announcing "AFK" to all and sundry. Luckily the phone came with its own HUD, and after wearing that you can (among other options) set that text (to No Texture), as shown in figure 7. HUDS can be very useful in other ways. Perhaps we want to show Dr Buggle with a bit more expressions in this panel. 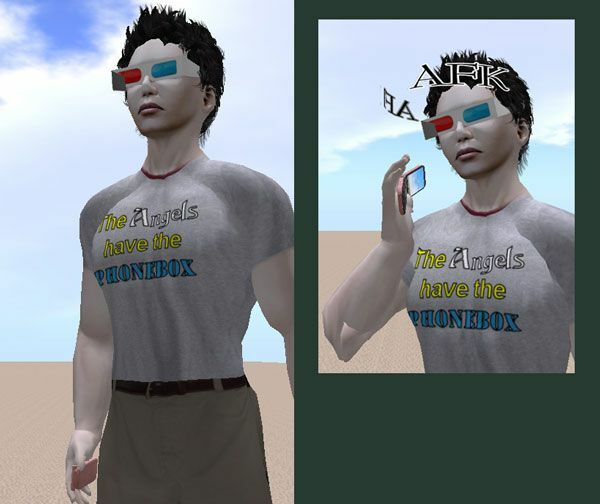 In Second Life we could use the free AnyPose Expression HUD. This allows you to set the expressions, and also eye and hand positions, as showing in figure 8.